Stanlow, and so eventually to the sea. Its source is close to Peckforton Moss, which it drains as it passes through, and near where its bigger sister, the River Weaver, also rises. From here to Stanlow is about sixteen miles as the proverbial crow flies, but the Gowy’s wanderings add another nine miles to this, though it used to be much more until a lot of the worst bends were straightened out by Italian POWs during and immediately after the second world war. Of course there are hundreds of ditches, conveying the water of uncounted miles of farmland drains, roads and housing estates to the Gowy. Over the centuries this network of waterways has had a profound influence on the lives of all those who have lived and worked within the river’s catchment area, although it may not be as apparent as, for example, the network of motorways, dual carriageways, airports and so on, that plague and disfigure the countryside. 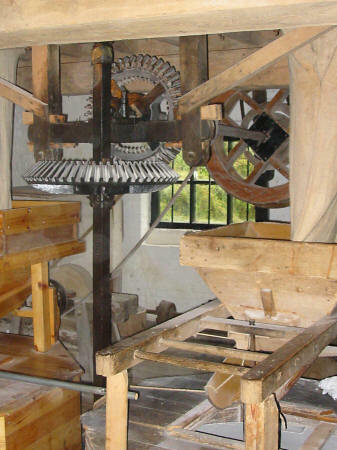 One of the ways in which man has harnessed the power of nature is by the use of water mills, and the Gowy and its tributaries have, at one time or another, powered twenty five of these mills, most of which were used for milling flour and occasionally for fulling, part of the process of cloth production. The majority have long since gone, victims of modern technology or disasters such as fires, to which they seem to have been very susceptible. There are however a handful left, some being private houses and some still open to the public, whilst evidence for those that have disappeared can be found in the many Mill Lanes, Mill Fields and Mill Farms that sprinkle the map and which we see when riding around the area. For those who want to see the start of the river, you should ride up Stonehouse Lane from Beeston towards Bickerton, and soon after the junction with Peckforton Hall Lane on your left, you will find a stoned farm track on the left hand side. This is easily ridden provided you don’t mind going through a certain amount of farming by-products! 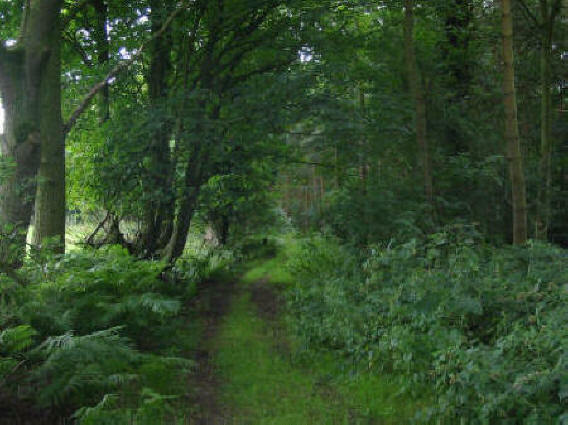 The track takes you into the heart of Peckforton Moss, which remains remarkably dry even in wet weather and becomes a footpath. Leave your bike and follow the path as it rises towards the A49 in the distance. The ditch that it crosses near the top of the rise is the River Gowy. Returning to the end of Peckforton Hall Lane and dismounting will enable you to see the river where it passes under the road and continues to Beeston via Peckforton Mere. Looking carefully you will see the river, in reality an overgrown ditch, running alongside the garden of a black and white cottage at Beeston next to the barn conversion. Soon it passes under the Bunbury road and goes down towards Beeston Castle as the roadside ditch, sometimes piped, before turning away from the road on its way to the A49 at Bunbury. As we approach Bunbury, the river disappears underground some way from the A49, which it goes under, and emerges on the right hand side by the turn for Bowe’s Gate and Alpraham. It is still a very modest ditch and slides apologetically along till it reaches Bunbury Mill. But before we ride there, let us examine the story of the Image House, and its association with witchcraft. As we ride from Beeston to Bunbury we reach the staggered crossroads with the A49 and turn left towards Beeston Brook. Very soon, in the angle of the main road and a tiny lane on your left, you will see a small cottage with stone Voodoo dolls on its walls. 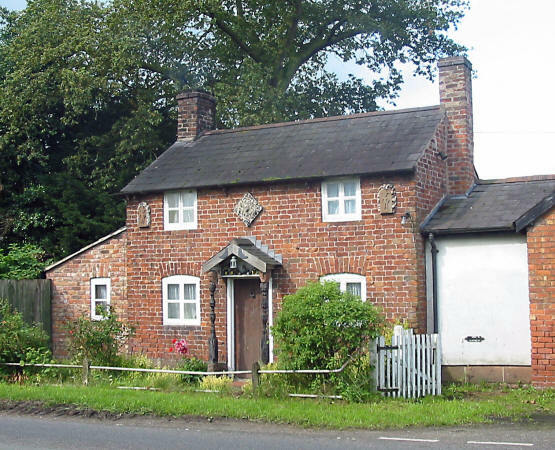 This is the Image House, and features in “The Shiny Night” by Beatrice Tunstall. The story, based on one of the very few real events of witchcraft in Cheshire, is about a young poacher who kills a gamekeeper, is transported to Botany Bay for eight years, returns to Clock Abbot, as Bunbury is called in the book, and sets about getting his revenge on his enemies. He makes images of them, names them and curses them violently, and places these Voodoo dolls on the walls of his house for all to see. The book tells of his struggles in life, his family and his eventual rise to great prosperity, mostly at the expense of his bitter enemies, all of whom come to a sticky end due to the spells he cast on them. It is an excellent read, the only drawback to it being that a lot of the dialogue is spoken in Cheshire dialect, which is not as easy to understand as you might think. The earliest record of mills in the Gowy valley occurs in the Doomsday Book, and horizontal wheels, a relatively inefficient form of waterwheel, would have powered them. From the Middle Ages onwards vertical water wheels became the most common type, being of two main kinds, undershot and overshot. The overshot wheel, where the water hits the top of the wheel, is the more efficient of the two, as it uses less water to produce the equivalent amount of power to a similarly sized undershot wheel. 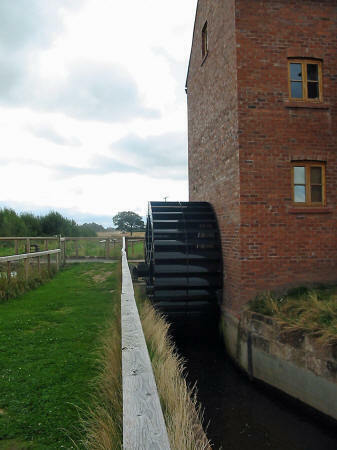 However, to do so it requires sloping terrain to enable the millwheel to be built below the lowest water level in the millpond, and such terrain is in short supply in the Gowy valley. 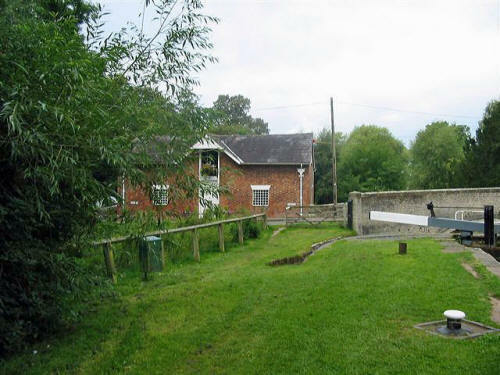 As it happens, the first and only site suitable for an overshot wheel on the river was close to Bunbury, where the river drops steeply for about 20 feet or so, and it is here that Bunbury’s Mill was built in 1260. 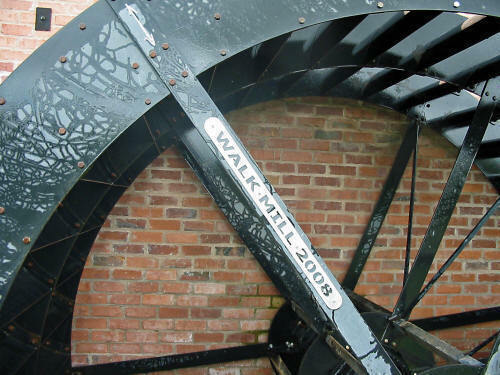 Various versions followed as damage, repairs, alterations and technical progress dictated, with the present mill being built in about 1850 with an eleven foot overshot wheel, its predecessor having burnt down in 1844. In 1960 there was a violent storm, which amongst other things, uprooted trees close to the mill and blocked the weir gate. The miller, Tom Parker, whose name still appears on the outside of the building, was unable to free the tree, and the build-up of water eventually burst the millpond wall, flooding the mill and wrecking the machinery. big as that, so that in dry weather the lack of water power must have been a constant source of anxiety to the miller. In order to counteract this drawback there was a furnace to drive a steam engine used to power the mill in times of drought, hence the tall chimney shown at the side of the building in some pictures of the mill. It is no longer there. The next remaining mill is at Tilstone Locks and is now a private house. It is on a tributary of the River Gowy, which rises near to Spurstow and joins the Gowy immediately after it emerges from the mill as the tailrace. 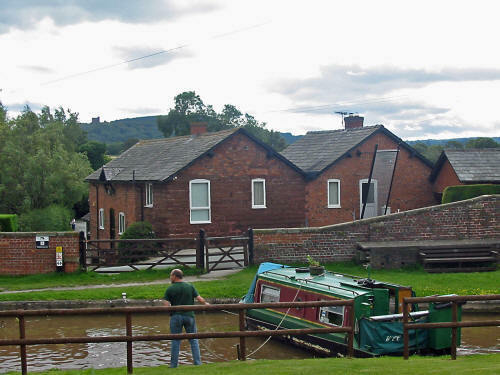 The original millpond was over three acres in extent, but no longer exists, and the Gowy proceeds quietly on its way between the railway and the Shropshire Union Canal to Beeston Brook. Descending the A49 past the Wild Boar into Beeston Brook, and opposite the left turn to Beeston Castle, we find Mill Farm on the our right, close by the Gowy. Although there is evidence on the Tithe Maps of a large millpond and tailrace, there is no reference to a mill of any sort; perhaps the mill had been destroyed before the 1836 maps were produced. There is a sawmill a little further down, almost in Beeston Brook, but this does not appear on the maps until the 1910 OS edition, so it is difficult to see that this has any connection with Mill Farm, though there is a possibility that the farm was originally a sawmill that ceased working before the 1836 Tithe maps were produced. In Beeston Brook, immediately before the road goes under the railway bridge, we find Beeston Castle Auction. This appears for the first time on the OS 1910 map, and has been of immense service to agriculture and its allied trades ever since. Sited to the west of the Auction is an MOD underground WW2 petrol depot; if Adolf had bombed it there would have been a really spectacular bang and fireworks. Like three old friends, the railway, river and canal continue side by side until they reach the Shady Oak, originally known as the Royal Oak. Here is an old mill, again now a private house, known as Bate’s Mill, and situated in Bate’s Mill Lane, by Bate’s Mill Bridge. So far, so good. But there is something of a conundrum to do with the name of the mill, since on the 1836-51 Tithe maps, the OS maps of 1875, 1910 and today, it is known as Horton’s Mill in Bate’s Mill Lane, despite the fact that the Tithe maps show a Peter Bate as the tenant. The owner of the mill at this time was Samuel Cooper, a substantial landowner and tenant, with widespread holdings ranging all over Cheshire and into Staffordshire. Soon after this the river passes under the canal and becomes a bit more worthy of the title of river, as it increases in size somewhat, but is still, in my opinion at least, only a moderately sized brook. Moving on down the river, we pass Mill Farm, Huxley, where a flourmill is shown on the 1835-51 Tithe maps and the 1910 OS maps. The modern OS map shows no sign of the large millpond, which features in all the earlier maps. A little lower down the river we arrive at Lower Huxley Hall, close to which there was a flour mill, shown as disused on the 1910 OS map, but no other details are available on the Tithe maps, except for the existence of a large millpond, but which was probably done away with when the river was straightened in the 1940s. 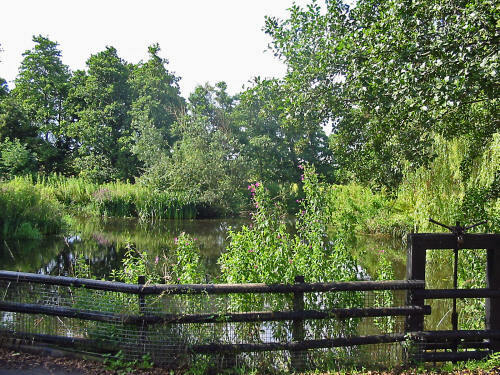 Further down the river, and close to the Walk Mill, there is the site of a 12th century wooden fort, which was surrounded by a moat, and is listed as a scheduled monument. Some silver Viking coins, at present in Chester Museum, were found close to the mill, the coins being very like others found in Ireland. 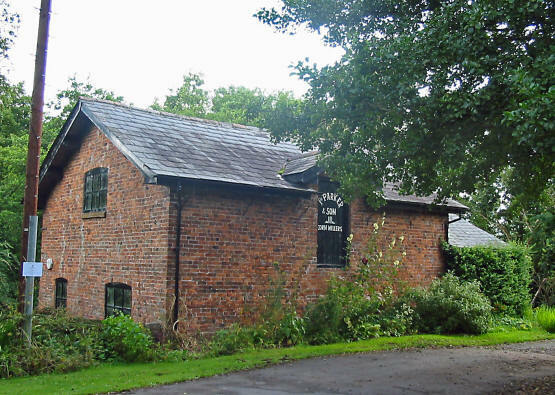 The name Walk Mill tells us that at one time in its history the mill on this site was used in the woollen industry as a Fulling Mill, a fairly unusual type of building in Cheshire, because the county has been primarily a dairying area with relatively few sheep. Fulling is part of the process used in making woollen cloth, and was also known as Tucking or Walking, hence the name of this mill. In Wales such a mill is called a Pandy, and this name occurs frequently. Fulling consists of cleaning and thickening the cloth, and it was, and is still, a pretty smelly business. To clean the cloth in Roman times, slaves, called “Walkers”, would stand ankle deep in tubs of urine and cloth, stamping their feet, walking round and round. The urine contained ammonium salts which cleaned the cloth, and was so valuable that it was taxed. It’s astonishing that our grasping politicians have not cottoned on to this lucrative source of income, but it must only be a matter of time! In the Middle Ages fuller’s earth was used in conjunction with urine and nowadays soap is used. Once the cleaning had been done, cloth made from short staple wool had to be strengthened by matting the fibres together; this was unnecessary for material made from long staple wool. Water was used for this, and also to rinse out the foul liquids used earlier in the process. As water mills came into common use, some of them were modified to mechanise the cleaning and thickening by the operation of hammers battering the cloth as it was passed slowly through tubs of wash and then over rollers and a stream of water. Once this was complete, the cloth was stretched out to dry by being fastened by hooks to a device known as a tenter, hence the expression “to be on tenterhooks” meaning to be in a state of suspense. If you are careless with woollen jumpers etc when washing them by using water that is too hot, or setting the machine on the wrong cycle, you will achieve much the same result - a lump of thick, heavy and shrunken cloth! According to the Doomsday Book, there has been a mill on the site of the Walk Mill ever since those far off days, and in 1219 the lease for the mill was one pair of gloves. In the media, the homes of the rich and (in)famous and solicitors' offices up and down the land, there is currently much talk of pre-nuptial settlements, but this is nothing new. On April 21st 1692 there was a pre-nuptial agreement between John Bruen and Honor Winnington which included Walk Mill and its land. There were two mills at Stapleford: Walk Mill and Stapleford Mill half a mile or so further down the river, and in 1792 they were both sold, along with other land, to pay debts to the tune of £6,460 of Richard Ashton, a monumental sum for those times. History does not record how these debts were incurred - slow horses and fast women perhaps? However dedicated he was to these pursuits, it’s difficult to believe that they were solely responsible for his downfall. Walk Mill ceased to be occupied in 1959 and soon became a victim of lack of use and was demolished in the mid 1960s. The present mill is a brand new building incorporating a café where flour ground on the premises is used to make sandwiches and cakes, whilst bread and flour is available for sale. When grinding is to take place, a sluice gate is raised from the riverbed, thus diverting the water into the now short millrace, on to the 14-foot wheel and back to the river by the tailrace. The wheel and sluice gate are new constructions, but much of the internal machinery has been rescued from other mills in the country that have been converted to private houses. According to the 1910 OS map, the present course of the river past the mill was the original millrace, with the river following a line to the east of its present course. The river line was altered in 1945 by Italian POWs and the old riverbed is now part of the curiously named “Waterless Brook”. This takes the overflow of the river when it floods, a not infrequent occurrence in recent years. The site of the nearby Stapleford Mill, now called Stapleford Mill Farm, is a short distance away from the present course of the river as a result of the efforts to straighten the river up. Down through the centuries millers have never featured very highly in the popularity stakes, occupying a position similar to that which estate agents, lawyers and bankers do nowadays. Nonetheless, millers have been absolutely essential to life ever since people collected or grew grain for use as human and animal feeds, as until the grain was either kibbled (cracked) or ground, neither man nor beast could get any sustenance from it. 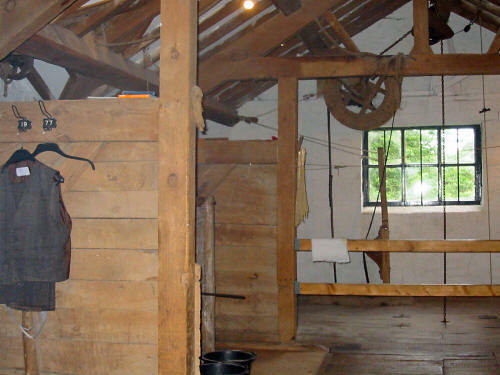 The low opinion that almost everyone had of millers was partly due to the fact that under the feudal system the downtrodden poor in the shape of peasants, tenants or villeins had no choice but to take their grain to the Lord’s mill, where they were forced to leave 10% as a Tithe payment. Additionally, there has always been a strong suspicion that less weight of flour came out of the mill than the grain that went in. The millers claimed that this undoubted and inevitable discrepancy was unavoidable because of the dust generated in the grinding process, but some millers seemed to their customers to be dustier than others! Whatever the justification for these suspicions, there are very few records of financially strapped Millers. They and their mills were also at the heart of another controversy caused by the proliferation of mills in the Gowy valley. At one time there were 12 mills covering 15 miles of the river, and their millponds, weirs and races acted as a considerable brake on the progress and escape of floodwaters in wet periods. This was not to be taken lightly: in one year in the middle of the 19th century there were 13 summer floods recorded, causing great loss to farmers and landowners due to the loss of hay being swept away, and land being too wet to graze cattle on. 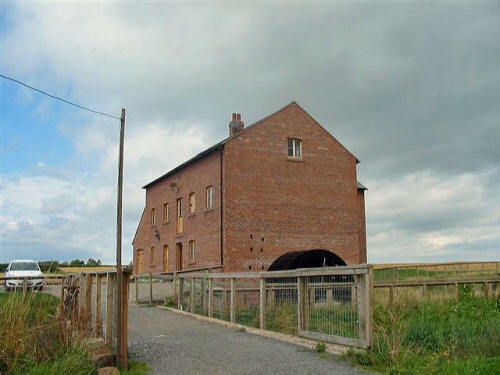 Soon after passing Stapleford Mill Farm, the river wanders through Hockenhull Platts, a piece of land of about eleven acres in extent which is now a nature reserve run by the Cheshire Wildlife Trust by agreement with the Grosvenor Estate. Three packhorse bridges, known locally as the Roman Bridges, cross the river and its flood channels. Roman they most certainly are not, as they were built in the Middle Ages on what passed as the main road from Lichfield to Chester, and they retain their original surface of rather slippery cobbles. It is said that the bridges are haunted by the ghost of a servant girl, Grace Trigg, who was beheaded by some of Cromwell’s squaddies for having had the temerity to protect her master’s silver from them. On dark nights she is alleged to wander across the bridges with her head tucked under an arm! Moving on downstream, we come to Stamford Mill, now a private house, but in the 1836-51 tithe maps it was shown as a flourmill in the ownership of the Marquis of Westminster, tenanted by Joseph Rowe. It was rebuilt in 1810 after being burnt down. 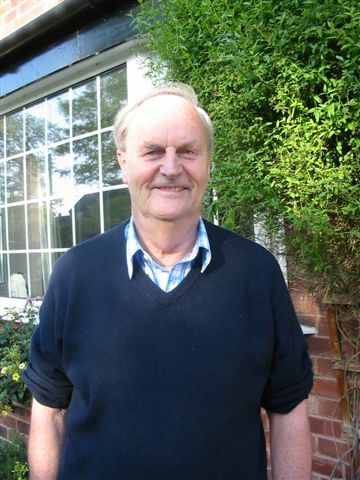 Joseph Rowe was another entrepreneur with extensive interests over a wide area of West Cheshire, both as owner and tenant, and would have been a considerable figure in agricultural circles. A mile or so after going under the A51, the Gowy is joined by one of its major tributaries, the Milton Brook. One branch of this brook rises on Primrose Hill, above Tirley Garth from where it flows through the grounds of this house, and the other branch, an even smaller stream, originates very near to Willington Hall. Soon after its start, we find Willington Mill, the first of four mills on this small stream. Designated by the OS map as a flourmill in 1875, it is downgraded to a mill by 1910. I’m uncertain as to the significance of this change of title. Perhaps it means it was just a storage and distribution building, and the term Mill was frequently applied to such buildings in the agricultural trade. Whilst the millpond remains, the mill itself has disappeared. The next mill is at Duddon and would seem to have finished working between 1875 and 1910. 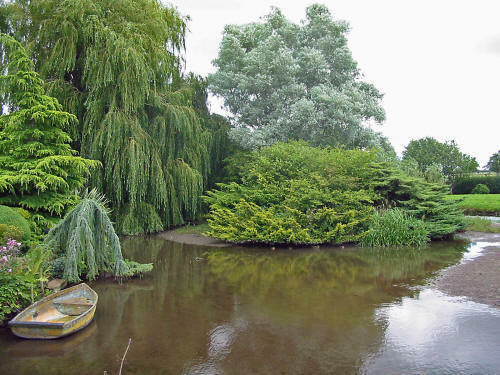 It is now a private house with part of the millpond remaining. The Brook wanders dreamily along to Tarvin, passing the former site of Express Dairies and going under the A54 immediately after which we find the next mill. The main claim to fame of this mill is that it appears to have been the proud possessor of the only rectangular millpond of the mills that are connected to the Gowy. The mill still exists, but seems to have stopped producing flour sometime between 1875 and 1910, a condition that applies to the last mill on this brook at Great Barrow, now a private house. 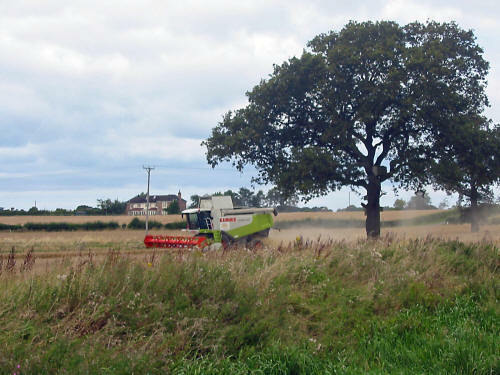 There was another mill sited near to Little Barrow, now known as Swinford Mill Farm, but this is on the Barrow Brook, which originates in Delamere Forest close to Fox Howl as the Ashton Brook. 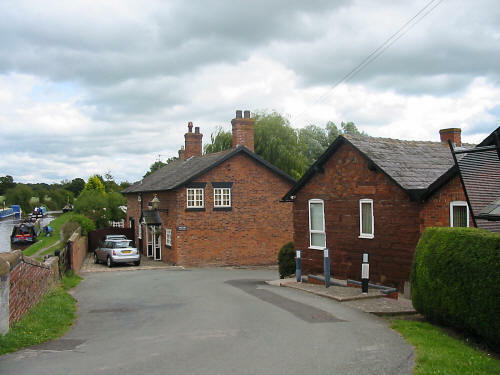 From the forest it goes between Mouldsworth and Woodside, through a fishpond established between 1875 and 1910 and on towards Little Barrow where the mill is now a private house. Neither the Tithe maps nor the 1875 and 1910 OS maps will admit that there was a mill there, despite showing a millpond, but the old mill is incorporated in the present house. There is a certain lack of precision about the mapping of mills on this stretch of water, since there is evidence of another mill close to the Mouldsworth Motor Museum. The evidence in question is the name of a property called Mill House on the 1910 and modern OS maps, but not the 1875 version, and the existence of a large millpond on the 1836 Tithes map. This latter map refuses to acknowledge that there was a mill, but there clearly must have been at some time, so presumably it had been demolished prior to 1836. The Barrow Brook joins the Gowy close to Bridge Trafford, and if you have managed to stay awake so far, you will probably be relieved to know that we are now approaching Trafford Mill, which I believe is the last mill on the Gowy and its tributaries. The earliest reference to this mill is in 1302, and in 1917 it suffered one of its periodic sales, the sale particulars showing that it had two undershot wheels, one of them out of action. This is now a grade two listed building, and was taken over by the forerunner of United Utilities in 1952 after it had ceased to be a working mill. It was in a derelict state and in the 1970s it was re-roofed. Further work was carried out in 1998. The current plans are to convert it to a museum and visitor centre, for which purpose a limited guarantee company has been arranged. Looking at the OS maps for 1875 and 1910, it is very evident that from a little way downstream of Beeston the Gowy was an extremely sinuous river, most unlike its present relatively straight course. This serpentine course was conducive to the formation of marshy ground between Bridge Trafford and the river's entry to the Mersey, much of it being labelled “Liable to flooding”. 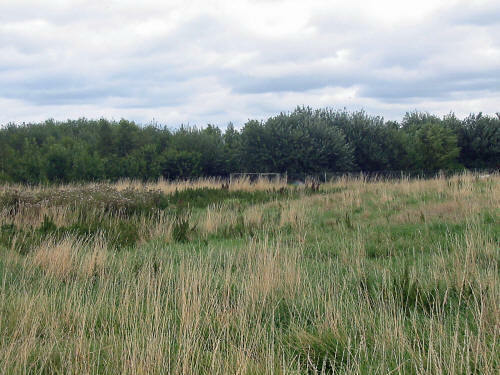 In January 1795 it was on these marshes near Mickle Trafford, in a field called Gibbet’s field, that a couple of the local tearaways, James Brown and Thomas Price, were “Gibbeted” after being hung elsewhere, probably at Chester Castle, for abducting and robbing the local mail boy. In times less squeamish than now, the practice of Gibbeting was a refinement in the capital punishment process, and consisted of displaying the corpse at the site of the crime, usually by a well used track or road. If the crime was a particularly notorious affair, the corpse might well be quartered, with the bits being displayed in different places. Often the corpse would be covered in tar or other preservatives, in order to prolong its useful effect, the intention being to deter other would-be miscreants from similar crimes. Those of you who commit crimes such as cycling on pavements, running red lights and riding the wrong way down one-way streets, for which many excitable people aver you should be hung, will be relieved to know that gibbeting was outlawed in 1843. Recently, the Gowy Marshes Nature Reserve has been established by the Cheshire Wildlife Trust on land owned by Shell UK. This land, 395 acres in extent, extends from the A5117 to the M56 and is an area of peat covered with wetlands or grazing fields. 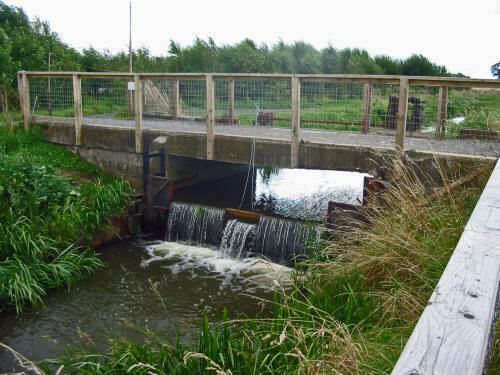 According to surveys conducted by the Environment Agency, the Gowy’s eel population has remained at a high level in spite of a massive decline in European rivers. It is unclear why this should be so, but it is suspected that the partially closed nature of the river, due to the siphon carrying it under the Manchester Ship Canal, may be the cause. As the river neared the Mersey, the land became more and more marshy with a wider estuary than is now apparent, and with the remains of the only two wharves being found on the northern shore, both of them on the Mersey side of the Manchester Ship Canal. The presence of these wharves is the only physical evidence that now exists to support the theory that the river may have been navigable in the Middle Ages, but gives no indication of how far inland the small boats of the time could get. The last part of the river now passes through the Stanlow Oil Refinery, which is built on reclaimed marshes. Run-off from the refinery, along with that from the nearby motorways, caused pollution in the river’s lower reaches, but Shell and environmental groups have cleaned it and restocked it with fish. The final point of interest in the story of the River Gowy concerns a Cistercian Abbey that was built by John FitzRichard, 6th Baron of Halton, on Stanlow Point in 1178. It had a chequered career due to the forces of nature getting the upper hand: it was flooded by the Mersey in 1279 and eight years later the tower gave up the ghost in a storm. In case anyone thinks that it is only in modern times that rivers have been polluted, it should be noted that the drains from this abbey went into the Gowy, which probably gave the fish and eels a headache. In 1296, after much bickering between King Edward I and the Pope, it was agreed that the Abbey could move to Clitheroe, where not content with changing location, it changed its name to Whalley Abbey. This small, relatively insignificant waterway has had a very considerable influence on the lives of all who lived and worked within its watershed. How many rivers in the UK have been straightened by POWs? Not many, I’ll be bound, and as we ride around its catchment area perhaps we should reflect more on the influences of nature rather than taking inordinate pride in such man made ephemera as motorways, airports and so on. Will they have a life as long and as useful as our river? I very much doubt it, so let’s enjoy and cherish the river and its history as we ride round its catchment area.